Millennials are willing to pay for premium dining experiences and want to share it with our friends on social media, in shared albums and other digital networks. Are we voyeurs? Sorry, maybe that’s off topic. But the reality is — despite the narrative — that us millennials love information — not only about our peers but experiences we seek out. Given this dynamic, restaurants are always seeking new ways to attract my generation, which now dominates a key consumer demographic. And there’s a way to do it through an emerging technology that you’ll hear much more about in 2019. As technologically savvy as we may be, my generation also wants to live through its senses. Augmented reality provides a way for restaurateurs to reach consumers through the sense of sight. Augmented reality can help to customize the restaurant experience. Think about the old restaurant sales paradigm: A waiter greets you at your table, asks you what you want to drink and explains the menu to you. So, during the sales process restaurants have only capitalized on one of your senses — it doesn’t take a “Jeopardy” contestant to figure out which one — when in reality the dining experience is about so much more. I think everyone would agree it would help a restaurant's sales if they could show patrons a dish before it’s served. It would cut down on food being sent back — making those in the kitchen more efficient, allowing front-of-house staff to turn tables quicker and providing a more enjoyable experience. We’ve all heard the idea of making someone’s “mouth water.” That comes from seeing the food more so than any other sense. Essentially, it weaves interactive digital elements such as informative overlays and 3D previews with our physical world surroundings. But I’ll translate that into more tangible terms. Someone points their phone at a menu in a restaurant and the dish — with all the trimmings and potentially the temperature at which it’s cooked — appears on your screen. I like to think of it as bridging the gap between the physical and digital worlds. It seems, to an extent, we’ve all abandoned the physical in favor of the digital. Really there’s a way to meld both together in a really advantageous way. Augmented reality would allow restaurant goers to not only view a dish but manipulate as you would when it arrived on your plate. Zoom in on a steak cooked medium rare and see the juices flowing. Spin a plate of white fish to see how the sides are served. Is the main dish on top of potatoes? Is there corn on the side? Maybe you’re a person who likes to mix flavors but is on a date with someone who likes their sides separate. And do all of this before the actual plate arrives at your table. Augmented reality can help to customize the restaurant experience. And customization is a trend across several industries. Or think about how a restaurant could sell itself before you even walk in the door. The dish can be created in augmented reality simply by pointing a smartphone at a barcode or website. It’s an opportunity for an establishment to start the sales process earlier. And what business owner wouldn’t want that opportunity? It would be like Rambo flexing his muscles before a confrontation. It avoids a lot of havoc. Or maybe more to the point — it’s the equivalent to getting scenes from another episode of your favorite television show. It provides just enough to entice you to want more. That’s precisely what restaurants want. The technology itself is not yet mainstream, but you’ll see it begin to be integrated into the restaurant business later this year. We’re near perfecting it. By 2020, you’ll see widespread adoption and by 2021 may not be able to avoid it. 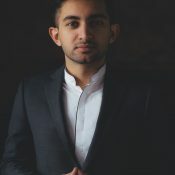 Aaqib Usman is a serial entrepreneur and the Founder of Midwest Immersive, an interactive multimedia studio specializing in augmented reality, projection mapping techniques and audio-visual software. Some of his clients include both national and global brands such as Adidas, Cadbury, Invisalign, Nike, Lurie Children’s Hospital, Make-A-Wish Foundation and 1871 among others.